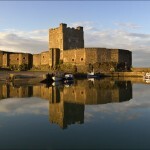 Monea Castle is an Historic Castle in Northern Ireland. 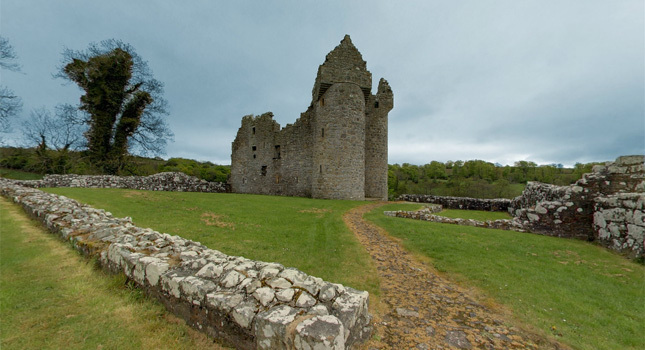 The castle, started in 1618, was built for Malcolm Hamilton and appears to be strongly Scots influenced. It is a rectangular tower house three storeys high, with tall attics and vaulted ground floor. Two massive semi-cylindrical towers sit on either side of the entrance. 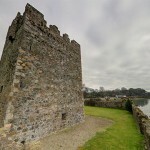 In the Irish Rebellion of 1641 it was attacked by Rory Maguire as it was built on lands which would have been owned by that family prior to the Plantation of Ulster. 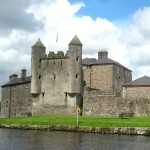 In 1688 it was occupied by Gustav Hamilton, the Governor of Enniskillen, who died in 1691. 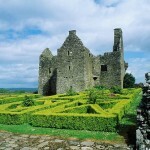 His wife and children continued to live at Monea, but had to sell the estate in 1704. 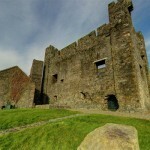 A few decades later the castle was gutted by fire and subsequently abandoned. Whilst the castle is now a ruin, and a little off the beaten track, it offers a fascinating glimpse into Plantation architecture for adults, and a great place for kids to play hide & seek.